Carriers is a multiplayer Half-Life 2 mod being created by the Shellshock Gaming development team. It's based around a modern-day zombie apocalypse, where players must work together to survive. But now the luck of the carriers has run out, and their immune systems are failing. Post news Report RSS	We're not dead! That's right, we're still here, and we've been working a lot. We haven't got anything that we think is worth showing, really, because it's still very WIP-y. However, I thought I'd post these. This decal is the first "survivor banter" texture we've made. 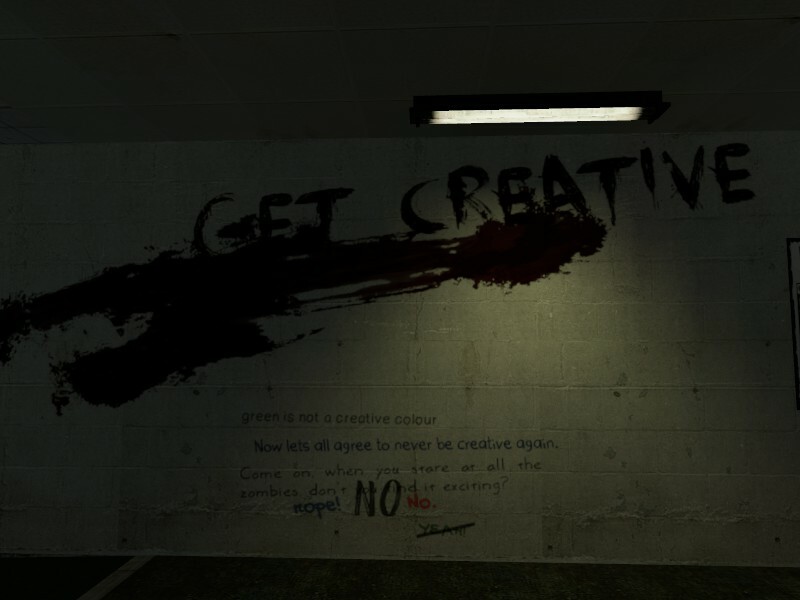 Safehouses and other areas will have various graffiti from other survivors, some being comical while others explain parts of the story. This particular decal is a reference to the unsettling Don't Hug me I'm Scared. This is a new area in ca_town. It is underground, slightly below road-level. The rain coming through the hole will probably be removed because I'm unsure if I want the town to be rainy. I changed the fog slightly, but it still needs some fixing.